There are all kinds of advanced services being launched at the moment to keep an eye on patients with new or long term health problems, like gadgets or more advanced professional devices. However, BetterFit Technologies is working on a new service called BetterFit Text, which aims to change the relationship beween patients and doctors and make communications much much easier. 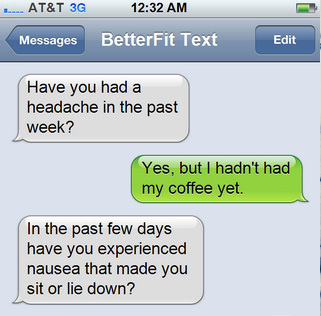 BetterFit basically opens up a channel of communication between doctors and their patients through text messages. However, to save time and money it uses the company’s advanced artificial intelligence platform, so doctors don’t need to analyse every response all the time. The system works when users receive a few questions via SMS about their symptoms and overall health, like “Have you had a headache in the past week?”, which are tailored to their specific drug regime and past conditions. They then answer based on how they’ve been feeling and can even add in extra prompts too. The system uses all of the data that’s been gathered from the users in order to find out how they’re doing and can then make healthcare decisions and alert doctors to problems. The service may look super simple, but it’s the easy way it only relies on a text message and the company’s natural language processing capabilities that could turn it into a valuable too for those in the medial profession. Visit: http://text.betterfit.com/ for more information.